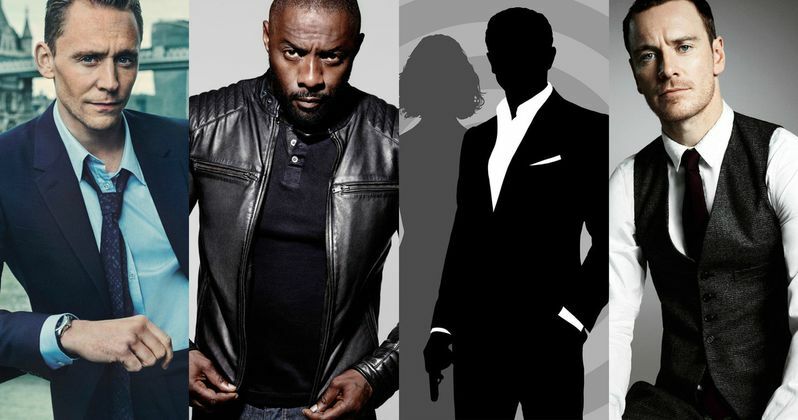 James Bond Shortlist Includes Idris Elba, Tom Hiddleston & Michael Fassbender? It has been nearly a year since Spectre hit theaters and though it didn't quite live up to the lofty expectations placed on it by Skyfall, fans still want to see Daniel Craig return as James Bond. The problem is, we still don't know if that is going to happen, so the studio is reportedly looking for his replacement, should Craig pass on the opportunity to continue on as 007. Now, a shortlist has emerged, and it is a very mixed bag of potential candidates to take on the role of James Bond. UK Celebrity gossip site The Sun is reporting that Sony and MGM have narrowed their search to six potential names for the next James Bond movie, which will be the landmark 25th installment of the franchise. The list includes long rumored names like Idris Elba, Michael Fassbender and Tom Hiddleston. The rumored list also includes a couple of less talked about, but occasionally mentioned names with Charlie Hunnam and Luke Evans, but most surprisingly, the relatively obscure Aiden Turner is in the mix. The report also mentions that Jamie Bell and James Norton have met with producers, but are not on the actual shortlist. A source at MGM had this to say about the new Bond, stating that Elba seems to be the favorite. "To get anyone to take over from Daniel will be a tough job. There will be a lot of trepidation about a new Bond, but Idris' talent and proven appeal gives executives a lot of heart. Idris may be a little older than the other candidates but he looks like he is still in his 30s. MGM are confident that they are in a pretty strong place with a raft of talent available." Idris Elba's name has been thrown around for quite some time in regards to being a favorite to take over as James Bond. While all of the other candidates are in their 30s, Elba is 43 and is definitely a bit older to be taking over the role. However, he does look the part and definitely has the chops to do it. Elba himself has stated that he has not had any conversations with the studio, and also joked about being a bit too old for the part. Here is what he had to say in a recent interview with Good Morning America. Tom Hiddleston still smells like the most likely choice, all things considered. He is the perfect age (35), and there are whispers that Thor: Ragnarok will be his last go as Loki in the Marvel Cinematic Universe. So, he'll be free. Most interestingly, though, was a few months ago when bookies had to stop taking bets on Hiddleston to be the next Bond because the odds tipped so heavily in his favor that they were worried about losing money. He has reportedly been spotted meeting with EON Productions franchise boss Barbara Broccoli, who is ultimately in control of the decision. Plus, Hiddleston just starred in the limited series The Night Manager, which may as well have been an audition for the part. The other choices on the list all seem to make sense in their own way. Michael Fassbender is one of the most sought after, talented actors working today. He also has the charm and he looks pretty good in a Tux. The in-demand element may also make him the least likely to actually get the role as well, though. As for Charlie Hunnam and Luke Evans? They both seem to look like a more rugged look and both occupy the same space in terms of fame and ability, at least on paper. The problem being that neither of them has a name that pops like Elba or Fassbender, so it is likely they aren't the top choice at the moment. Then there's Aidan Turner. Yes, he starred as Kili in The Hobbit trilogy and is currently on the show Poldark, and he is age appropriate at 33, but save for that, he seems very much like an outside candidate when compared to the rest of the pack. That being said, so was Daniel Craig at the time. Ultimately, since Sam Mendes won't be back, once a director is chosen, then things will heat up. "While the MGM executives have an idea, Barbara makes the ultimate decision on the role. Once Barbara decides who she wants to direct, then the audition process will be vital." All of this could mean nothing if Craig decides he would like to accept the dump truck full of money that the studio has reportedly offered him to return as James Bond one (or two) more times. His new show Purity, according to Showtime CEO David Nevins, won't get in the way if he decides that is what he wants to do. There have been conflicting reports, with some saying that he is really, truly done with the role, and others saying that he has yet to make a definitive choice. Either way, Sony and MGM can't wait forever, so if Craig puts his foot down and really is done, it looks like one of these six actors could be our next 007 in James Bond 25.